Part Two: Has Britain Got Talent? Is A Lack Of Data Holding Back British Football Clubs? In Part One Oliver Page looked at what statistical data is available to domestic clubs outside of the Premier League and how clubs might be able to use this to increase their efficiency in the transfer market. In Part Two he investigates further the transfer market (under? )performance of these leagues and whether a way forward can be identified. Compare The Market: Is The Transfer Market Efficient? 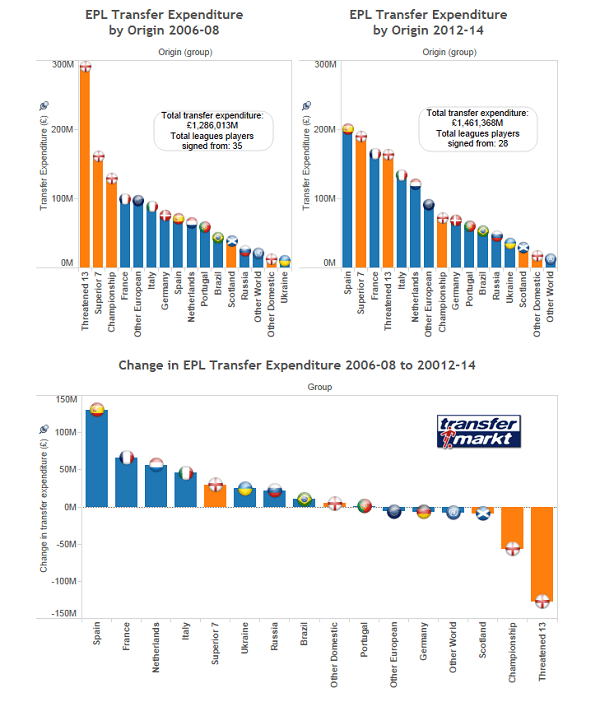 How do domestic divisions perform in the transfer market in comparison to other leagues around Europe and the World? In part one I wrote about the value of using statistical player comparisons to make better informed transfer decisions. Similarly, I want to use league comparisons to look more closely at the apparent decline in transfer market performance of domestic divisions outside of the Premier League. Comparing anything across different leagues can obviously be problematic as inherent differences exist in the relative standard of those leagues. If player A has performed well in his league and player B has done the same in a different league can we really compare them? If league A generated £x million transfer revenue what does that mean? Is it just a reflection of the quality of that league? These results are based on 1,251 votes so far and the full results can be see here. Obviously league standards can fluctuate over time (e.g. Glasgow Rangers demotion has weakened the SPL) but to my eye the ratings appear reasonable and are considered a useful tool for comparison. I took a selection of these world leagues and plotted their ‘ratings score’ against their respective transfer revenues for the last 8 seasons. Please note from here on I am combining pairs of seasons (e.g. 2006/07 and 2007/08 combined) as otherwise a single transfer in one season can sometimes distort results. Of particular interest was the comparison between the 06/07 & 07/08 period and the 12/13 & 13/14 period which can be seen below along with the full table of results. From 06/07 to 07/08 the English Championship generated more transfer revenue than the German Bundesliga. For the period 06/07 to 07/08 both the Championship and SPL were generating considerably more revenue from player sales than many leagues of a similar, and even higher, rating. Since then however, they have both been overtaken by the ‘better leagues’ and caught up by many of the ‘worse’ leagues. There may be lots of different factors at play here (e.g. the most recent Russian Premier League revenue is skewed by the collapse of Anzhi Makhachkala) but the most recent chart does show evidence of a growing relationship between transfer revenue and rating score. Worryingly for these leagues, the data suggests that the Championship and Scottish Premier League were actually OVERPERFORMING in the transfer market in previous years. Have they now just found their ‘true level’? It is also interesting to note, however, that a number of these leagues that have shown an increase in revenue are also those that have built strong relationships with data providers. In Part One we saw how the level of detail with which data companies such as Opta, Wyscout and Prozone cover competitions can vary from league to league. For example, the Bundesliga, Eredivisie and Russian Premier League have all had the full-detail level of Opta data available for at least 4 full seasons now. For the Championship this data only became available during 2013/14 and for the SPL, League One and League Two it remains unavailable. Obviously we should be careful to draw sweeping conclusions – correlation does not imply causation – but it is difficult not to be intrigued by the possible existence of this additional relationship. Where Do Championship Clubs sell players to? The data we have seen so far only shows total transfer revenue and a league could generate revenue just from buying and selling in-division and between its own members. Focusing now on the English Championship, where do its clubs sell their players to the most? In particular, what changed between the 06/07 to 07/08 period and the 12/13 to 13/14 period? Firstly, Championship clubs appear to have next to no market for their players outside of the top two English divisions. 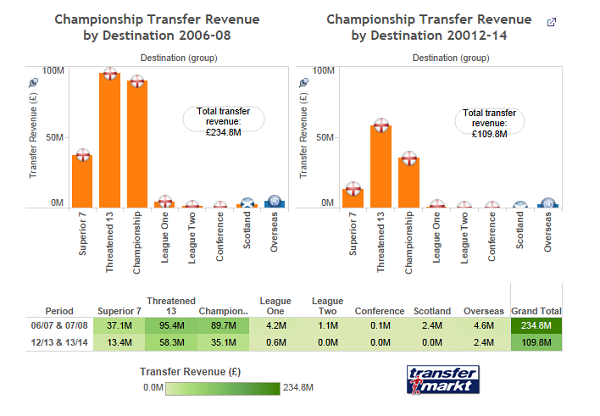 The majority of transfer revenue has always been generated by sales to either teams in the Threatened 13 or the Championship. Interestingly, a similar pattern exists in terms of where Championship clubs buy players from too. For example, for the period 06/07 and 07/08, Championship transfer expenditure was £203.8M. £76.5M of this went on players from the Championship and £45.1M went on players from the Threatened 13. Historically the Championship and Threatened 13 clubs have been locked in a cycle of selling and buying players the same players to and from each other. All three of the Championship’s main ‘customers’ are declining however. For example, sales within division are down from £89.7M to £35.1M and sales to Threatened 13 clubs are down from £95.4M to £58.3M. Is this due to lack of data to evaluate Championship players? Is the data available but just not being used for recruitment purposes? Or, is it the more worrying scenario that the data is available, it is being used for recruitment, and top clubs are just choosing to eschew an overpriced and overrated market? Where Do Premier League Clubs Now Buy Players From? Championship transfer revenue is down but the Premier League recently signed another record broadcasting rights deal and is continuing to spend as much as ever. Where is this Premier League money now going? Again, I will focus here on the changes between 2006-08 and 2012-14. As we have already seen, the historically inefficient domestic ‘loop market’ between the Threatened 13 and the Championship has been greatly reduced in value. The leagues that are the greatest beneficiaries of this include Spain, France, Netherlands and Italy. This cannot just be dismissed as the inevitable consequence of Bosman – this ruling celebrates its 19th birthday this year. In 2012-14 Premier League clubs actually signed players from LESS different overseas leagues than in 2006-08. It appears that there could be a trend towards Premier League clubs concentrating recruitment on certain specific leagues around Europe and the World. Several factors could be causing this. Firstly, the leagues which have seen the largest increases are also those grouped in or around the top of the world league ranking seen earlier. Empowered by the new television deal, even Premier League clubs outside the Superior 7 can now shop for players in these leagues. For example, a club like Southampton can now buy players from a club like AS Roma. Secondly, the most successful international side of recent years is Spain, and the most revered club side in world football is FC Barcelona. The unique style of football with which these teams have achieved their success has inevitably led in part to some Premier League clubs trying to replicate this style and to increase their signings from the Spanish domestic leagues. But it is also interesting to note again that the leagues which have seen the largest increases are also those who have been amongst the first to adopt detailed statistical coverage. Are we witnessing a more data-driven approach to recruitment making the transfer market more efficient? Championship clubs currently have next to no market for their “goods” outside of the UK and the Superior 7 are increasingly willing and able to find a more efficient market overseas. There is also evidence of this trend making its way down the ladder to Threatened 13 and Championship clubs. For example Newcastle now makes most of its signings from French Ligue One. Are clubs simply concluding that domestic leagues offer poor value? That is, a high cost player of a quality that, even if you can measure and benchmark it, is inferior? If the data shortage is a concern for young footballers’ attempts to get scouted, it is of even greater concern to the football clubs who have previously relied on revenue from an inefficient transfer market to survive. The above quote is my favourite from the recent Sloan Sports Analytics Conference. Without wishing to go over all of the recent pro- versus anti- statistics in sports arguments I think it is worth remembering that nobody is saying that statistical analysis in the be-all and end-all and the answer to all clubs problems. What I believe it can offer is a way to add context to decision making that would otherwise be made on the basis of such things as instinct or experience. Perhaps it can tell you how a midfielder’s attributes compare to similar players elsewhere around Europe? Or perhaps it can provide you with an objective way to draw up a short-list of young talents outside of your own division. My background is in sports betting where everyone understands that a shift from 48% to 52% could be the difference between winning and losing in the long run. Unfortunately such long term and probabilistic thinking is rarely a luxury afforded to football clubs. Football, and indeed sport in general, is a game of opinions and almost everyone has one. Go to a stadium, watch a match in the pub or follow the game on Twitter and almost everyone has a opinion and everyone is an expert. I have basically watched sport for a living for the past 8 years but will happily admit there is a LOT that I still do not know about it. There, I said it. One way I like to help to get more information to help me make decisions and form opinions is to use statistics. My version of the above quote would be something like ‘it mostly takes the bravado out of sports‘. As we saw in Part One, we may not know for sure exactly what the situation is ‘on the ground’ – clubs and data companies are secretive – but we do have increasing evidence of a trend towards analytical recruitment in football. Data analytics is not ‘taking over‘ but it is an invaluable tool for assisting in decision making processes. The top clubs are doing it and before long everyone else will follow. It is no longer a choice of whether or not to embrace statistical analytics but WHEN and HOW. Teams outside of the Superior 7 need to recognise that they operate in a world market now and can no longer rely on the domestic market for transfer revenue. They will need to become more analytically ‘savvy’ and use every new technique at their disposal to compete in this increasingly competitive market. It is understandably difficult to know details of the funding for data collection and analysis. We do not really know who the largest clients of data companies are (professional clubs? the media? bookmakers?) or how much it costs to provide and get access to all the most detailed data but it is something not every club can afford. Why is it so expensive? To listen to some speak they would have you believe the data companies are the evil gatekeepers holding all the data for themselves in their ivory towers and charging a kings ransom to anyone and everyone for the privilege to use it. Yet I have seen first-hand the intensive process Opta undertakes to fully code just a single game – I am sure similar processes exist at Prozone – and obviously data companies cannot provide this service for free. My understanding of the current system is that clubs are responsible for their own relationships with data providers – they are individual clients and have to pay for the breadth and depth of service that meets their own needs. This ad-hoc system is in contrast to how much of the same information is provided in the major American sports. For example the NBA recently agreed a deal to install optical tracking cameras at every team and also to make the data available to the public. In soccer, the MLS has a league-wide relationship with Opta which has been considered a great success both on and off the pitch. A hot topic in UK football at present is the perceived poor performance of our national teams and the relatively limited opportunities given to young British players at Premier League clubs. The Football Association are currently commissioning their own investigation into this and only this week the Times newspaper is running a series entitled The Good of the Game. What would happen if a governing body such as the FA, SFA or Football League decided to invest in data analytics for the benefit of every club? I do not know what the cost of this might be – this could be an impractical non-starter – but investment does not have to be purely financial. If clubs’ own analysts do not have the time or skills to deal with the newly available ‘big data’ then could this work be centralised and centrally funded? I am sure there are lots of people with the necessary skills out there who are only too willing to help as this article makes clear. If statistics and video coverage makes it way to all of the domestic leagues will we necessarily see a recovery in transfer revenue in those leagues? We do not know. Will it just confirm the suspicion that clubs have been overpaying for players in these divisions for years? Possibly. Only time will tell but if you are a club and you don’t adapt to these new market conditions your future could be difficult. Or if not, and you are a young player at one of those clubs, it might be time to check you have a valid passport.